The Icefields Parkway (also known as Highway 93 or the 230km stretch of road between Lake Louise and Jasper in the Canadian Rockies) is one of those epic drives that, year after year, gets mentioned in roundups of “top road trips in the world.” That’s with good reason too — even though I live in the foothills of the Rockies and get to see the Parkway on a regular basis, I am still constantly in awe as I drive along the seemingly endless valleys with mountains towering all around me. Most of those roundups feature the Icefields Parkway in summer. During the months of June to September, the drive is incredibly easy, with the main obstacles being fellow tourists driving erratically (largely because of the other obstacle of local wildlife). There is only one pass to traverse (Sunwapta Pass, near the boundary between Jasper and Banff National Parks) and none of the switchbacks that you’ll find familiar if you’ve driven in the Colorado Rockies. 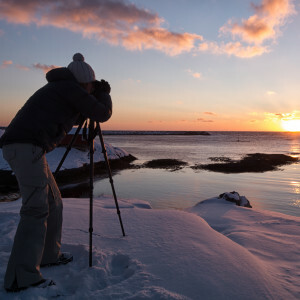 You can easily cruise along at the speed limit — that is, if you’re not stopping in every possible pull-off to take photos of your epic surroundings. I mean, how can you not stop and stare at views like this? Driving the Parkway in winter is a completely different proposition. Unlike the TransCanada to the south, the Icefields Parkway is considered to be a mountain highway and is thus not as well maintained. 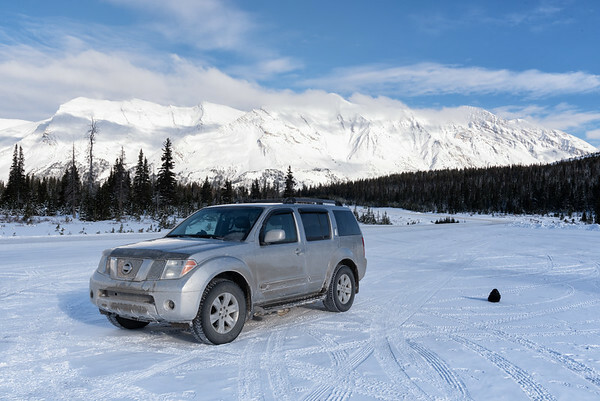 While Parks Canada does make a concerted effort to ensure that the road is open for most of the winter, it presents a number of challenges that aren’t an issue elsewhere in the national parks; if you’re not prepared, your dream road trip could easily turn into anything but. On the flipside, if you are prepared, you can have a trip of a lifetime that you’ll share with hardly anyone else during this very quiet time of year. 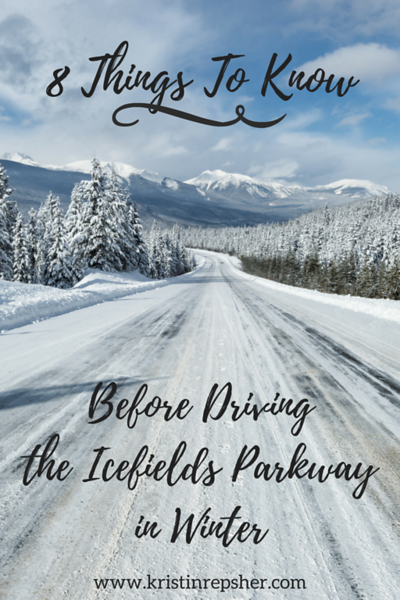 From my experience having driven the Icefields Parkway in deeply winter conditions a number of times, I’ve included a number of tips below that are crucial that you know before your trip. Following these won’t guarantee that you have an issue-free trip, but they will certainly help to mitigate a number of the risks encountered. 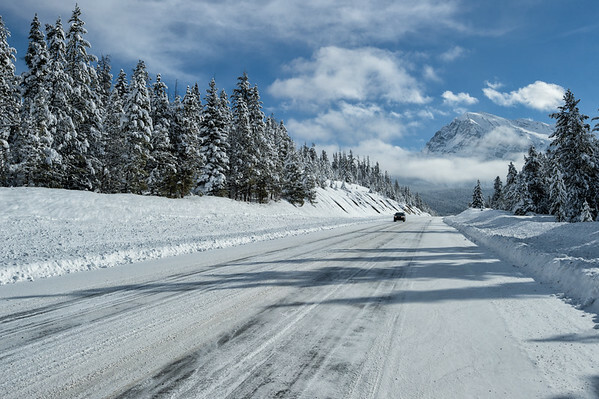 This is not an option; it is a legal requirement that all vehicles on the Icefields Parkway have either winter tires (generally marked on the tire with a snowflake symbol inside a mountain) or be fitted with chains between November 1-March 30 each year. 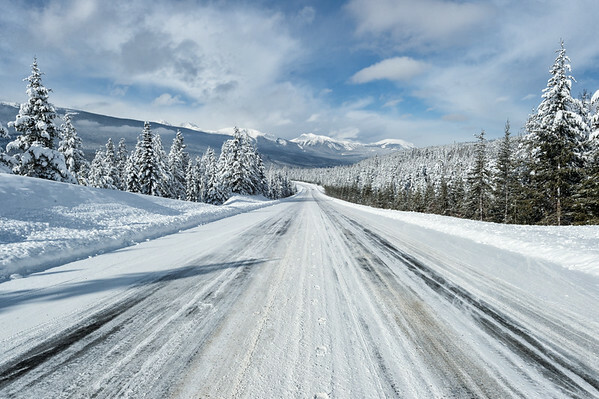 It’s not legal to try to drive here without winter tires or chains on your vehicle. If you’re thinking, “no worries. I’m renting a car so they’ll give me the tires I need to drive safely in winter!” you should think again. Unlike in Quebec, it’s not a legal requirement that all cars have winter tires in Alberta. That means that rental car companies DO NOT give you winter tires unless you specifically ask for them (and pay a daily surcharge for their use). They generally will not indicate this when you book, and it’s too late to request them when you arrive at the rental car desk as they only have a few sets of winter tires at any location. For instance, when I tried to book a rental car for my parents, I could only get winter tires from the Calgary Airport (YYC) or Banff Budget locations; nowhere else in the area even offered them. Some rental car companies will try to offer you an AWD vehicle to make up for not having winter tires. While this is a huge benefit in winter conditions (see tip #2), it is not a legal substitute for winter tires and you can still get ticketed for driving on the Parkway. My Pathfinder in the parking lot at Parker Ridge. It’s impossible to tell the difference between its tires (M+S winter tires) and the tires I use in summer without a closer look at the tires themselves. Also, that isn’t a rock next to it — it’s one of the ravens that you’ll find in seemingly every parking lot along the entire Parkway. If you don’t have the option for winter tires, then buying chains isn’t an expensive endeavour; these chains I found on Amazon are less than $50 and you can find similar in brick-and-mortar stores like Canadian Tire. If you are using chains, put them on in a parking lot in Lake Louise or Jasper as there is very little space to pull over (see tip #7) on the Parkway. This can make the Icefields Parkway seem more remote than any other factor listed here. You’ll lose reception around Herbert Lake (around 5km north of Lake Louise) and you won’t get it again until Athabasca Falls (30km south of Jasper), where you’ll occasionally pick up a few bars before losing reception again for most of the rest of the trip into Jasper. This isn’t something that’s likely to change in the next few years either, as no telcos have made any indication that they plan to add reception in this remote area. 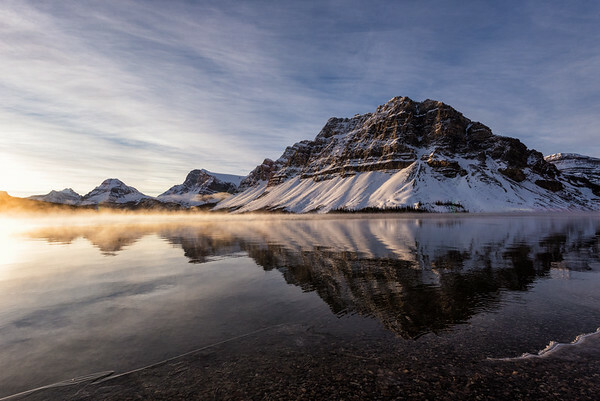 You won’t be posting amazing scenes like this one, captured during golden hour at Bow Lake, until many hours after you’ve seen them due to the complete lack of reception on the Parkway. This means that you’ll not only need to be fully up-to-date on weather reports and road conditions (see tip #3) before you set out, but it also means that, should you need help, it might be a while before you can get in contact with anyone. The beautiful mountains towering in all directions around you make sure of that, as there’s so little reception that you can’t even make emergency calls. So what do you do if you need help? If your vehicle is completely disabled (i.e., you have hit a large animal or you are stuck in a bank of snow), you’ll need to sit in your car and wait to flag down any passersby. In turn, they’ll either stop and help remedy the issue (i.e. tow you out of the ditch) or they’ll continue on and call emergency services or roadside assistance when they can. There are two payphones in the Athabasca Falls parking lot. There are also payphones at Beauty Creek Hostel, not far from where this photo was captured. Even if some of the payphones don’t accept coins anymore, it doesn’t hurt to have them on hand just in case. In addition, some of these payphones may require a significant amount of work to access, as most day-use areas on the Parkway are not maintained in winter and can therefore be under a thick blanket of snow. Please note that all payphones are from Saskatchewan Crossing north; neither myself nor the writer of the article in the Fitzhugh have found working ones on the stretch between Lake Louise and Saskatchewan Crossing. One important thing to know about winter tires is that they are often not studded. This means that they will give you no additional grip on ice, but they are designed to better grip the road when it is cold and partially covered in snow. Why am I telling you this? 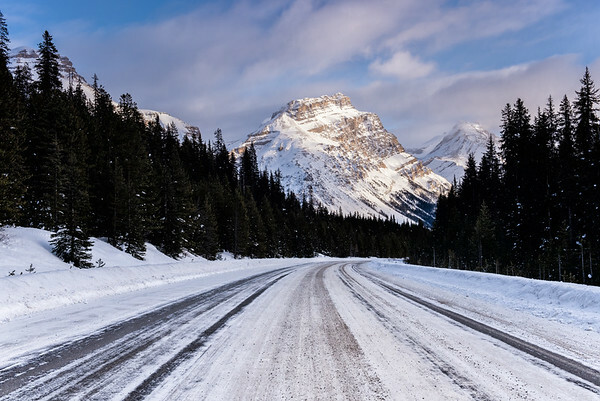 Well, it’s important to know that the Icefields Parkway will likely be covered in ice, snow, or a combination of both on your winter trip, so you need to be comfortable driving in these conditions — and just as importantly, you’ll need to be prepared in case something goes wrong. 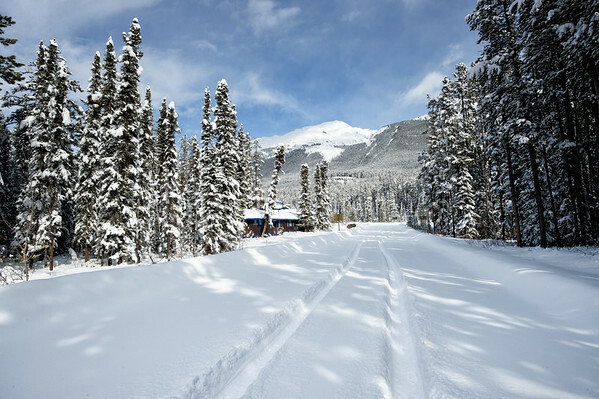 These conditions, seen near Bow Lake, are quite good for winter on the Icefields Parkway. They were classified as “fair” on the conditions board at the Lake Louise entrance. A 4WD or AWD vehicle does not go astray in conditions like these; however, just because you have a 4WD doesn’t mean you’re invincible. I’ve probably seen more SUVs off the road in winter conditions than not; this is obviously for a variety of reasons, but some of those drivers may have become complacent. Black ice can sneak up on you. Since this is a mountain highway, it doesn’t benefit from 24-hour maintenance like the TransCanada. The road is only plowed between 7am-3.30pm daily, so you’ll want to try to limit your travel to those times. Short jaunts outside these times are fine (for instance, heading to Athabasca Falls from Jasper), but you don’t want to find yourself at Sunwapta Pass in the middle of a heavy snowstorm only to realise the next plow won’t be arriving for another 17 hours or so. The road to Sunwapta Falls (a 1km side road off the Parkway itself) in March. One vehicle had attempted and made it into the parking lot, although the bottom of his truck had dragged along the snow for much of the way. We later saw a Parks Canada truck nearly get bogged trying to enter the same road. Rather than risk getting stuck ourselves, we walked to the falls. Even if the weather conditions are good, there is minimal traffic on the Parkway in winter, and even less outside of these times. That means that, if you do happen to get stuck or otherwise need assistance, you’ll potentially be waiting quite some time before you see anyone. This means that you need to be well-supplied. Bring a roadside assistance kit (something you can pick up in stores like Walmart in Calgary and Canadian Tire in Canmore) that includes some basics like matches and thick blankets. Have a few extra thick blankets and a number of extra layers in case you have to spend the night in the car (when temperatures could easily get down to -30ºC). Tools and a knife can come in handy, and a shovel could mean the difference between being stranded and heading on your way. Finally, extra food and water is a must. All services on the Parkway close in mid-October and do not reopen until mid-May, so there is nowhere to buy any additional food in the entire 230km stretch. 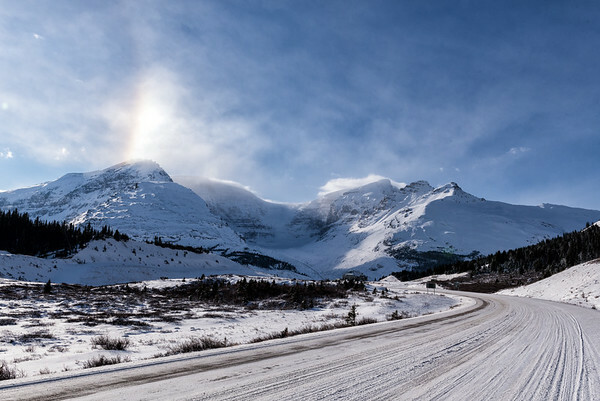 Part of a sundog appearing over the Columbia Icefields. It’s beautiful, but this phenomenon tends to only happen when it is very, very cold (it was around -20ºC when I took this shot). Finally, it would not hurt to phone ahead to your hotel that you plan to check into at the end of the day. Tell them that you plan to be driving the Icefields Parkway and that you will be checking in before the end of the day. This means you’ll at least have one other party aware of your plans that (could) raise the alarm should you not show. Before you set out, check either 511Alberta or the AMA mobile app for the latest road conditions. I personally use the AMA mobile app as it allows me to quickly skim all road conditions throughout the area, but if I want more detail I simply click on a section of road and get a quick popup with a full description of what I can expect. An example road condition report from the AMA App. Both 511 Alberta and AMA will alert you to extreme snowfall conditions (if 10cm or more is expected in the next 12 hours). Be sure to pay attention to this, as heavy snowfall can mean white-out conditions where the road and the falling snow all seem to blend into one. Environment Canada will also mention when heavy snowfall is expected on the Icefields Parkway in both its Banff and Jasper forecasts. Remember that mountain weather is extremely changeable, so don’t rely on these forecasts as fact; just use them as a good piece of guidance. Parks Canada does its best to keep the road open as much as possible in the winter. It’s worth knowing that the road closes much more towards the end of the winter (March onwards) as this is prime time for avalanches and there are a lot of avalanche tracks going across the Parkway (such as the one at Mount Hector that buried the road under metres of snow in May 2017). Parks actively monitors conditions and proactively closes the road to ensure that as many avalanches as possible occur when there is no traffic on the road. When the road looks like this, it will display as red on highway reports (indicating full ice or snow cover on the road). When closures happen, they usually don’t effect the entire Icefields Parkway. 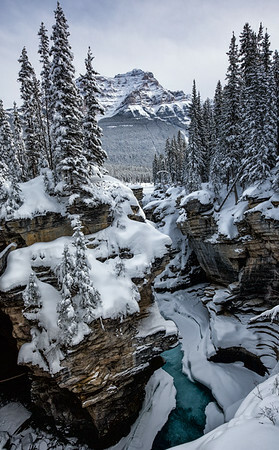 When it is closed, it is often either the northern section (from Athabasca Falls to Saskatchewan Crossing) or the southern section (Lake Louise to Saskatchewan Crossing), as you can exit the Parkway and head east on Highway 11 (the David Thompson Highway) at Saskatchewan Crossing. 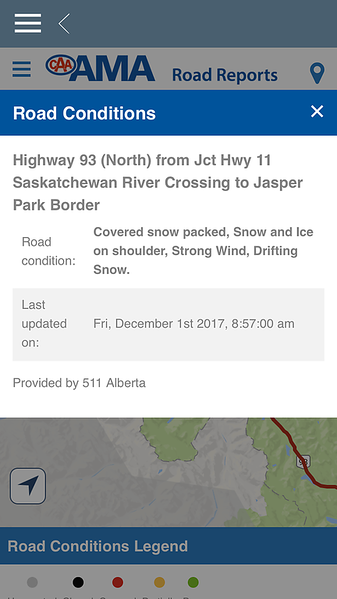 Regardless of whether the entire Parkway or just a section is closed, your journey from Banff to Jasper will be significantly longer so it’s good to be aware of conditions prior to the day you set off. Taking the Parkway, you will cover 280km between Banff and Jasper, which is a good day’s drive and certainly not unreasonable to try to tackle. However, if the northern half of the Parkway is closed, that 280km becomes 725km when you divert via Highway 11 through Rocky Mountain House. If the whole parkway is closed, it is 735km to go via Calgary and Red Deer. Alternatively, if you are heading south, it will be 670km if you have to divert via the David Thompson when the southern half of the road is closed. Any of these options will make for a much, much longer day of driving. The last point above leads into this tip: make sure you leave plenty of time for your trip. There is always the possibility that half of the Parkway could close as you are navigating the other half, so you could find yourself having to take the long way around regardless. The Sunwapta Pass area in mid-October. This lookout is in an avalanche zone in winter so you cannot stop, but you’ll still see this amazing view as you climb over the pass. 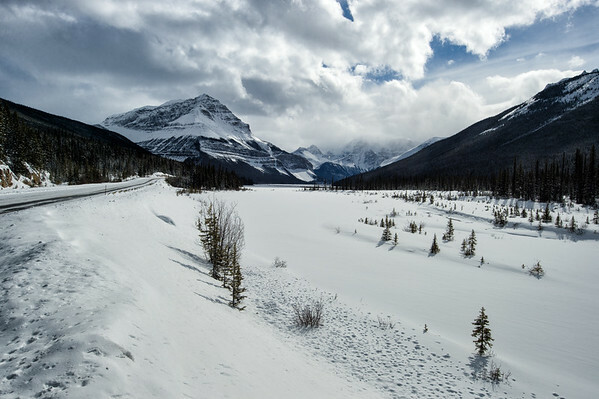 Even if the entire Icefields Parkway is open, it’s unlikely that you’ll make it between Jasper and Lake Louise in the minimum three hours (travelling at the 90kmh speed limit) that it takes in better conditions. 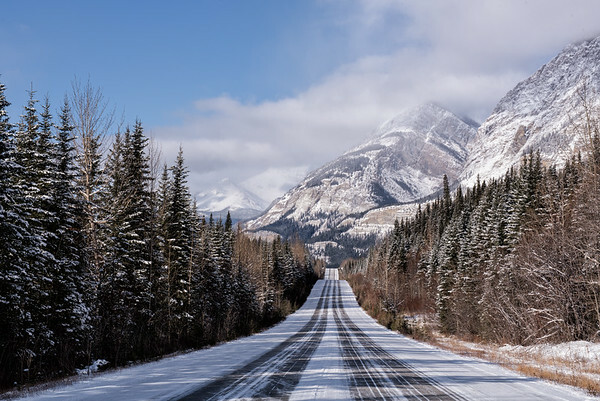 A number of sections of the Parkway are simply not navigable at 90kmh in winter, particularly the area around Sunwapta Pass where the speed limit drops to 60kmh for quite a while. Plus, you’ll likely want to stop a number of times as you’re driving (after all, you’ll be going through some of the most stunning landscapes you may ever drive through). You’ll be stopping pretty regularly for scenes like this (seen at the Lower Waterfowl Lake lookout). 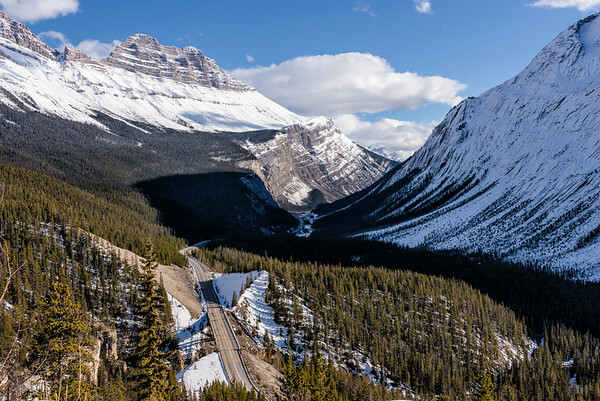 While driving the Parkway should take at most half a tank of gas, it’s important that you fill up in either Banff, Lake Louise, or Jasper prior to starting the drive. There are two big reasons for this. First of all, there are no gas stations on the Parkway in winter, with the only one (at Saskatchewan Crossing) closing in October for the season. The actual river crossing at Saskatchewan River Crossing. Second of all, if you find yourself stuck on the Parkway for any reason, that gas could be a lifesaver. The more gas you have in your tank, the longer you can run your vehicle and keep yourself warm overnight. While you should have extra layers and blankets (as mentioned in tip #3), sitting in a car heated to 20ºC while the temperature drops to -30ºC outside can potentially be a life-saving difference. In addition to gas, pick up an extra bottle of wiper fluid before you leave the gas station. Winter conditions will cause you to use significantly more wiper fluid than usual, and you don’t want to run out only to find yourself having to peer through the muddy snow smearing your windscreen. Wiper fluid sold in gas stations in Alberta is also generally rated to -40ºC, so you’ll want to use it rather than water (which won’t be useful at all in below freezing temperatures). The last thing you want to do is see an amazing shot and pull over onto some snow, thinking that it’s paved only to find out that it’s a snow-covered ditch. When everything is covered in thick snow, it’s hard to tell what might be a good place to pull off and what is just an accident waiting to happen. 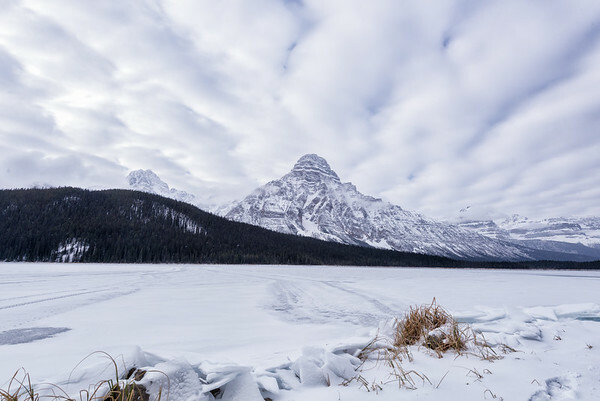 Most day-use areas will be closed with gates across their entrances, but some smaller parking lots (for instance, the Crowfoot Glacier parking lot near Bow Lake) will be plowed and have plenty of space to park. Along this stretch, just north of Saskatchewan Crossing, it was easy to tell how wide the pavement was before it turned into the ditch. If you can’t tell what you’re pulling onto, don’t risk it. You can always pull in as close as possible to the plowed snow on the edge of the road and quickly hop out; the road is so quiet in winter that you’ll be able to hear cars coming from miles away. However, please remember that you’ll be making the drive more hazardous for those that have to pass you, and that you’ll be blocking the path of any passing snowplows, so this is only recommended for very quick stops. Also, make sure you are constantly on the lookout for avalanche area signs. All avalanche areas are clearly marked with a start and end sign. Regardless of what you see (unless it’s a herd of animals completely blocking the road), these areas are NOT FOR STOPPING. You are in an active danger zone and could be putting yourself and any passersby at serious risk by getting out of the car in these areas. While some animals are hibernating for the season (for instance, black bears), that doesn’t mean that you’re home free while driving. Many animals actually spend more time on the road in winter, partially because there is less traffic, and partially because of the salt that is put down to melt the snow on the roads. 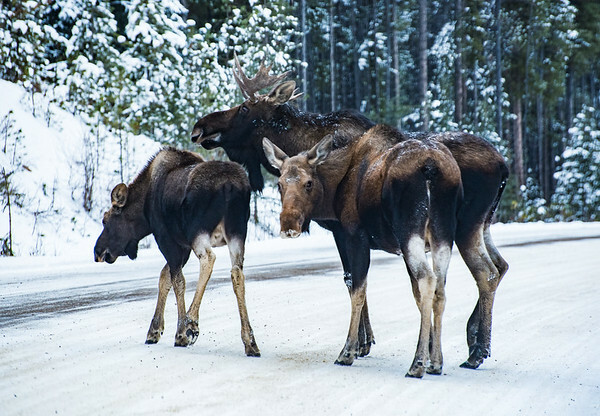 Moose, goats, and bighorn sheep all adore licking salt off the roads, and will often be found on the centre line where salt builds up between the lanes of traffic. They’ll stand their ground and guard that salt with their lives as well. We were very lucky to see three moose together on the Maligne Road the following day. The speed limit here is 60kmh so you can stop much more quickly for wildlife. Moose are often loners and are very dark, so they can blend in quite well with trees. 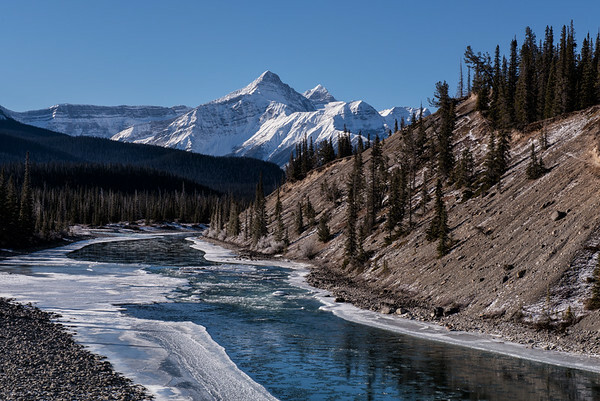 Elk and bighorn sheep can block the entire Parkway in herds, and 20km of the road between the Icefields and Sunwapta Falls has prominent warnings about caribou in the area. The last time I drove the Parkway, I saw eagles and a fox bolting from the road, where they had clearly been dining on some recent roadkill. For both the wildlife’s sake and your own, you don’t want to hit anything on your drive, so be alert and keep to a sensible speed. If you have slowed down significantly because of wildlife, ensure you have your hazard lights on to warn any oncoming traffic. 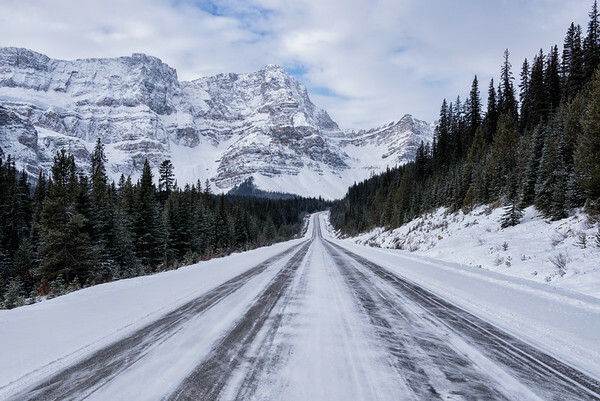 I know that, having gotten to this point, you are probably feeling a bit daunted and are potentially questioning your plan to drive the Icefields Parkway in winter. Don’t be; I just want to make sure that you know the risks and have planned accordingly so you can have a fantastic drive that is memorable for all the right reasons. Have a question about doing this drive in winter that I haven’t covered? Comment below or get in contact with me here. Thanks for writing this article, Kristin. Excellent info to help keep travellers safe on the parkway and some truly inspiring photographs! Thanks Ron! Glad you found it useful, and thanks for your tip on Facebook about black ice hiding under the snow even in May. I’ve had that experience as well and it’s something people generally won’t think about for a “summer” trip! Thanks for the information. We are planning a trip along the Icefield Parkway around Christmas this year. Are you able to give an indication of the likely conditions at this time. Will winter be in full swing or does the road conditions get worse after this time. Hi Lisa, great to hear that you’ll be heading over to the Rockies over Christmas! As for the road conditions on the Parkway, many of the photos in this post were taken in November, so by December, winter will most definitely be in full swing. It’s hard to predict the exact conditions as they vary based on recent snowfall and temperatures — sometimes conditions can be terrible in November but much improved by mid-December (which is what happened this winter). I recommend downloading the AMA app early and keeping an eye on conditions starting in November just to see how it’s looking. I hope you have a great trip and let me know if you have any other questions! We are thinking of driving this route next month (2nd half of October). Does it snow on the Parkway in October? Hi Naomi! It’s actually already started snowing on the Parkway (although at this point it all melts away fairly quickly). By the second half of October it will be snowing more regularly and sticking. I drove it on October 21 and 31 last year. October 31st was fine, but the 21st was a bit hairy. I was the third set of tracks on the road as I was driving well before plowing started and it had snowed around 5cm overnight. By the time I drove back from Bow Lake, there were around 8-10 vehicles stopped on their way northbound trying to put chains on their tires (as much of the snow had melted and revealed quite a bit of ice that they just couldn’t get traction on). I don’t want to scare you as the early season varies dramatically so conditions can be great or somewhat dodgy. I would just recommend being prepared; check out the AMA reports beforehand and make sure you have chains with you (and know how to put them on) if your car isn’t equipped with winter tires. I hope you have a great trip and please let me know if you have any other questions about the area! It’s my understanding that snowflake and M + S tires are different. Do you know which ones are required? Thanks! Hi Nathan. Sorry the wording was a bit confusing. Your tires have to have the snowflake symbol inside a mountain (like this one: https://www.tires-easy.com/blog/wp-content/uploads/2016/11/MountainSnowflake-symbol.png), but they can sometimes be marked with M+S below this symbol. Tires that only say M+S (all-season tires) aren’t considered to be winter tires.